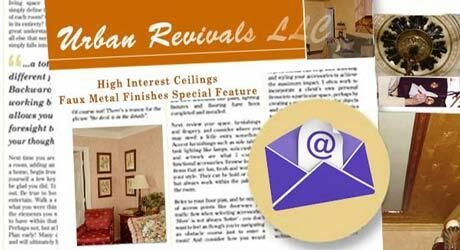 Urban Revivals has created stenciled walls, doors, and floors using prefabricated or uniquely designed stencils, created by our staff. 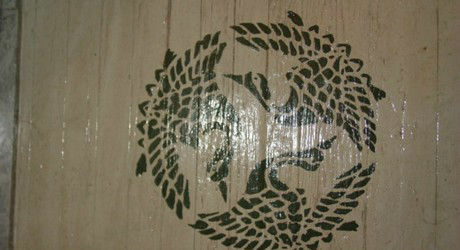 We create our stencils from heavy card stock, and cure them with linseed oil or shellac, for long-lasting durability. 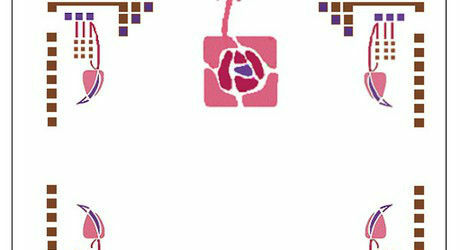 We can use your designs, or create new designs from books of ornament (for example, the purple stencil below was created from a 15th century Arabic floor design). 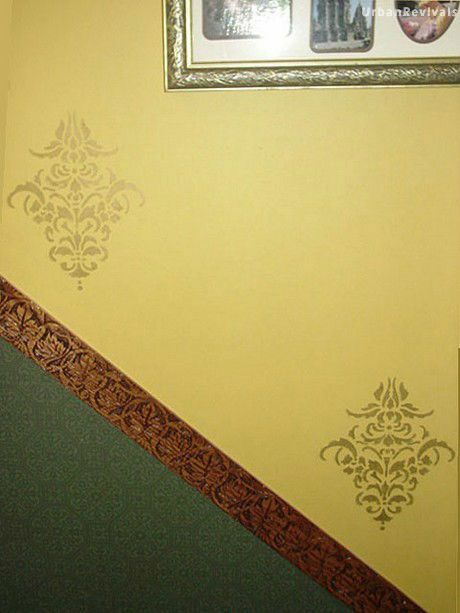 We also provide stencilling techniques in our monthly newsletters and e-books. We encourage you to join our list! 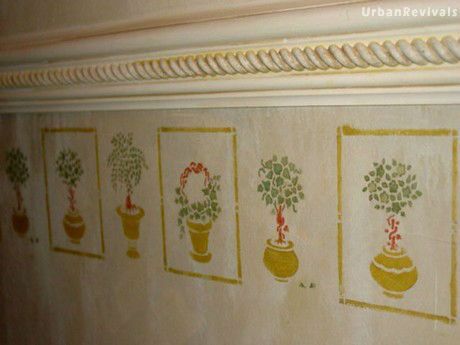 We create our stenciled patterns with latex paint, stencil crèmes, or even sprays. We can add additional freehand details, such as gilding or shadows. 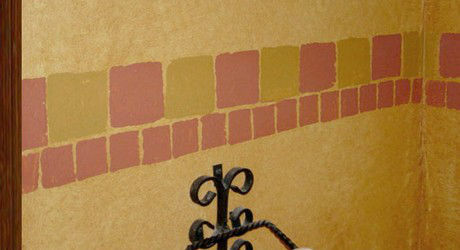 Stencils may also be lightly sanded, color washed, or limed to create an aged effect. This stencil was for a concrete floor. The stencilling was to be done with skimstone (a portland concrete pigmented blend). Quite a number of iterations were needed to ensure that the patterns, once expanded and implemented to scale, would land in the right places, and be properly offset from the walls. It was also necessary to determine the right balance between making it straightforward to implement, versus departing too far from the motifs of Charles Rennie Mackintosh, whose Willow Tea Room was inspiration for this room. Free E-Newsletter with Faux Finishing Techniques! This monthly newsletter focuses on new videos, new faux finishes, and free step-by-step procedures for how to create them. We'll also feature links to other artisans, new product releases, and links to e-books intended for do-it-yourselfers. 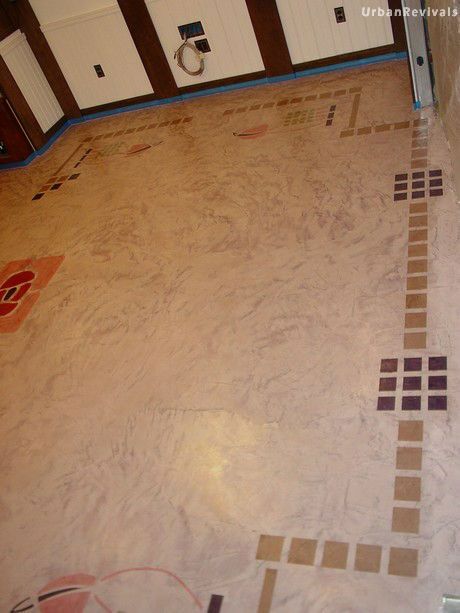 From design to the finished floor! This flooring was so distressed that it was painted a grey-white, whitewashed in a brighter white, stencilled in dark green, and sealed with many coats of Varathane. Even simple geometric stencils can enhance a room. Here, square painted mosaics circumnavigate a room stippled in yellow ochre glaze. 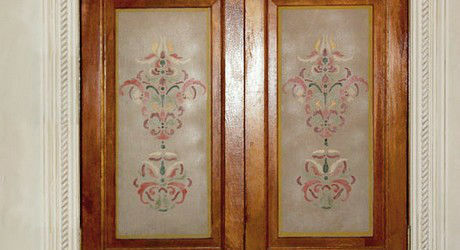 These ornate stencils mask the fact that behind these doors are a washer and dryer! The moldings have also been antiqued and a pediment (not shown) was finished in faux Florentine stone. These stencils used the same mask as the ones applied to the laundry room door. They follow the chairrail up the stairs. This is one of the easiest ways to apply stencils as the pastes do not drip.